I will add more later. First, Pastor Rocky Otwell, who was the son of my first Pastor. He is my favorite singer of all time, bar none. (1) Wilt Thou Be Made Whole? Christ, the fullness of God, poured out in life through believers, Chapters 3 and 4. Answers at the end, following the questions. Those who disagree with anything please see the note at the end. Reasoned dialogue is encouraged and any Bible or fact based comments, if made in a Christian manner in an attempt to get to the truth will be considered. This is an open book quiz meant to challenge the Bible believer – the saved person who believes the Word of God rather than the person who tries to fit particular Scriptures into a system of interpretation meant to validate one’s desired view of how things should be by philosophizing, allegorizing, or spiritualizing chosen Scriptures. The literal meaning, taken in its immediate context and within the context of all related Scripture is the basis for these studies. It is presented for the glory of God. Colossians directs our attention to the head of the body who is Christ. The body itself is secondary. Christ is the theme. He is the center of the circle around which all Christian living revolves. Christ is the fullness of God. The dominating thought is that Christ is all I need; He is everything. He is the primary object, and the thought passes downward to the church as the body of Christ. Colossians was written to the local church at Colosse (with the principles to be applied by all local churches and believers) to counteract the heresy of Gnosticism, the first heresy in the church. There were many forms of Gnosticism, and in Colosse there were the Essenes. There are three points of identification for this group: (1) They had an exclusive spirit. They felt that they were the people—they had knowledge in the jug and held the stopper in their hands. Thus, they felt that they were super-duper in knowledge and knew more than anyone else, including the Apostles. (2) They held speculative tenets on creation. They taught that God did not create the universe directly, but created a creature who in turn created another creature, until one finally created the physical universe. Christ was considered a creature in this long series of creations. Paul refutes this in Colossians 1:15-19. (3) They practiced asceticism and unrestrained licentiousness. They got the asceticism from the influence of Greek Stoicism and the unrestrained licentiousness from the influence of Greek Epicureanism. Paul refutes this in Colossians 2.16, 23 and 3.5-9. See, J. Vernon McGee, Colossians for more on this. Colossians 3.5 tells believers to mortify certain sins. Mortify means to put to _______. Fornication means sexual _____________. Other sins listed in verse 5 are ______________ (includes thoughts, words, gestures, and bad jokes); _____________ ____________ (uncontrolled passion or lust); evil concupiscence (evil desires); and covetousness which is idolatry (wanting more or wanting what belongs to others). “The ______ of money is the root of all evil” (1 Timothy 6.10). Those things in verse 6 bring “the _______ of God on the children of _______________.” Believers walked in the sins above before they were ________. (See Colossians 3.6-7). Believers also put off ________ (over the wrong things; some anger is justified), ________ (anger that becomes an unforgiving spirit), _________ (and that tries to take revenge and get even), ____________ (defaming the name of God (blasphemy against God); lying about someone else (blasphemy against another person), _________ ________________ out of their mouths (foul communication that is abusive or filthy). (See verse 8). The church at Colosse had put off the _____ _____ with his deeds and put on the “_____ _____ which is renewed in knowledge after the image of _____ that created him” (Colossians 3.9-10). “Where there is neither ________ nor _____, _______________ nor ________________, Barbarian, Scythian, bond nor free: but ________ is all, and in all” (Colossians 3.11). In the doctrinal section of Colossians, we learned that Christ is the fullness of ______ and head of His ___________. Believers have been made complete in _____, not in any man-made legal or philosophical __________. Colossians 3.12-17 teaches us that, since we have risen with Christ, it will lead us to holiness in our relationship to _________. Verses 18-21 deal with holiness in the _______. Verses 22-25 and Chapter 4, verse 1deal with holiness on the _____. Paul deals with the same things that he dealt with in Ephesians. Many questions could be added on all those verses. However, churches would be advised to study those verses out for themselves. Following are just a few questions. As Colossians 4.2 makes clear, _________ and ___________ go together. “Nevertheless we made our ________ unto our God, and set a ________ against them day and night, because of them” (Nehemiah 4:9). Watch and pray with _______________. Fellowship of Believers Is Hearty (Colossians 4.7-18). In Colossians 4.7-18, we come to a list of ________ of people whom Paul knew. They were in the midst of ___________, but they were Paul had a tremendous, far-reaching ministry. Many of the people named here lived in Ephesus. Paul had never been to Rome nor had he been to Colosse, yet he lists people he knew, many of whom were from those two cities. This indicates that he had led many people to Christ who returned home to cities he was never able to reach directly or personally. “___________” was the pastor of the church in _________ (See Ephesians 6.21, Acts 20.4, 1n3 2 Timothy 4.12)..
“______________” was a _________ __________ with Paul, and he was his friend. “_________” is John _______, the nephew of Barnabas—the son of his sister. He is the writer of the Gospel of ______. ______ left Paul and Barnabas on their first missionary journey, and because of this Paul did not want to take him along on the second missionary journey. Paul was wrong in his judgment of ______ ______, who made good. Paul acknowledges that here (“__________ him”). Paul mentions John Mark again in his second letter to Timothy: “Take Mark, and bring him with thee: for he is ______________ to me for the ministry” (2 Timothy 4:11). ________ (Justus) was Jewish (of the _______________). The Colossian church was mostly __________, but there were a few Jews in that church. These men are wonderful brethren, helpers of _______, and great missionaries themselves. ____________ was the pastor in __________. Now he is in prison. His new ministry there is _________. __________, ___________, and _____________, are close together. ______________, at that time, met in _________ (see verse 15). Churches started in the home. True churches are going to come back to the ________, as they have in many countries where they are persecuted. We do not know anything more about “______________” than is mentioned here. But the Lord had given him a ____________ and Paul urges him to fulfill it. This advice can be extrapolated to everyone to whom the Lord has given a ___________. Of course, if possible, that ministry is to be fulfilled under the authority of a local New Testament ________. For the second time Paul says, “Remember my ________—or pray for me. “________ be with you. Amen.” Paul wrote to a church he had never __________, but he knew many of the people and led them to knowledge of the _______ _________ ___________. Colossians 3.5 tells believers to mortify certain sins. Mortify means to put to death. Fornication means sexual immorality. Other sins listed in verse 5 are uncleanness (includes thoughts, words, gestures, and bad jokes); inordinate affection (uncontrolled passion or lust); evil concupiscence (evil desires); and covetousness which is idolatry (wanting more or wanting what belongs to others). “The love of money is the root of all evil” (1 Timothy 6.10). Those things in verse 6 bring “the wrath of God on the children of disobedience.” Believers walked in the sins above before they were saved. (See Colossians 3.6-7). Believers also put off anger (over the wrong things; some anger is justified), wrath (anger that becomes an unforgiving spirit), malice (and that tries to take revenge and get even), blasphemy (defaming the name of God (blasphemy against God); lying about someone else (blasphemy against another person), filthy communication out of their mouths (foul communication that is abusive or filthy). (See verse 8). The church at Colosse had put off the old man with his deeds and put on the “new man which is renewed in knowledge after the image of him that created him” (Colossians 3.9-10). “Where there is neither Greek nor Jew, circumcision nor uncircumcision, Barbarian, Scythian, bond nor free: but Christ is all, and in all” (Colossians 3.11). In the doctrinal section of Colossians, we learned that Christ is the fullness of God and head of His churches. Believers have been made complete in Him, not in any man-made legal or philosophical system. Colossians 3.12-17 teaches us that, since we have risen with Christ, it will lead us to holiness in our relationship to others. Verses 18-21 deal with holiness in the home. Verses 22-25 and Chapter 4, verse 1deal with holiness on the job. Paul deals with the same things that he dealt with in Ephesians. As Colossians 4.2 makes clear, prayer and watching go together. “Nevertheless we made our prayer unto our God, and set a watch against them day and night, because of them” (Nehemiah 4:9). Watch and pray with thanksgiving. In Colossians 4.7-18, we come to a list of names of people whom Paul knew. They were in the midst of paganism, but they were Paul had a tremendous, far-reaching ministry. Many of the people named here lived in Ephesus. Paul had never been to Rome nor had he been to Colosse, yet he lists people he knew, many of whom were from those two cities. This indicates that he had led many people to Christ who returned home to cities he was never able to reach directly or personally. “Tychicus” was the pastor of the church in Ephesus (See Ephesians 6.21, Acts 20.4, 1n3 2 Timothy 4.12)..
“Aristarchus” was a fellow prisoner with Paul, and he was his friend. “Marcus” is John Mark, the nephew of Barnabas—the son of his sister. He is the writer of the Gospel of Mark. Mark left Paul and Barnabas on their first missionary journey, and because of this Paul did not want to take him along on the second missionary journey. Paul was wrong in his judgment of John Mark, who made good. Paul acknowledges that here (“receive him”). Paul mentions John Mark again in his second letter to Timothy: “Take Mark, and bring him with thee: for he is profitable to me for the ministry” (2 Timothy 4:11). Jesus (Justus) was Jewish (of the circumcision). The Colossian church was mostly Gentile, but there were a few Jews in that church. These men are wonderful brethren, helpers of Paul, and great missionaries themselves. Epaphras was the pastor in Colosse. Now he is in prison. His new ministry there is prayer. Colosse, Laodicea, and Hierapolis, are close together. Christians, at that time, met in homes (see verse 15). Churches started in the home. True churches are going to come back to the home, as they have in many countries where they are persecuted. We do not know anything more about “Árchippus” than is mentioned here. But the Lord had given him a ministry and Paul urges him to fulfill it. This advice can be extrapolated to everyone to whom the Lord has given a ministry. Of course, if possible, that ministry is to be fulfilled under the authority of a local New Testament church. For the second time Paul says, “Remember my bonds—or pray for me. “Grace be with you. Amen.” Paul wrote to a church he had never visited, but he knew many of the people and led them to knowledge of the Lord Jesus Christ. Should you disagree with an answer given, please explain why you disagree in the comment section below the article. All reasoned comments will be published, perhaps with reply. The purpose of this website is the Glory of God. God cannot be glorified by shutting out honest disagreement in the search for truth. The author would be interested in your explanation. The comments are required by the website to be approved or disapproved. The author is very busy with many matters and may or may not immediately notice your comment. He will address it as soon as he notices it. He almost always approves comments presented with a godly spirit. He never alters comments. Sometimes, he replies to comments. God gave his people in the Old Testament ______________ that are only _________ (a religious or solemn ceremony consisting of a series of actions performed according to a prescribed order.) and liturgical (relating to a form or formulary according to which public religious worship is conducted). Paul explains that those were merely “a ________ of things to come” (verse 17). They were pictures of ________. Since ________ has come, there is no need to go back to the picture. “To whom God would make known what is the riches of the glory of this mystery among the Gentiles; which is ________ in you, the ______ of glory” (Colossians 1:27). Colossians 2.18, 19 is a warning against mysticism (belief that union with or absorption into the Deity or the absolute, or the spiritual apprehension of knowledge inaccessible to the intellect, may be attained through contemplation and self-surrender). Paul here is condemning the Gnostics who made a pretense of _________. Today, some in churches assume a pious _______________. They are “spiritual snobs.” These people, generally, are very ignorant of the ________. “____________ into those things which he hath not seen.” That is a pretense, putting on, _________ like you have something that you don’t really have. Those spoken of in the question 3, are not “holding the ______, from which all the ______ by joints and bands having nourishment ministered, and knit ___________, increaseth with the increase of God” (Colossians 2:19). What a description! Chapters 3 and 4 are the practical section of Colossians. In chapters 1 and 2 we saw the preeminence of Christ. We saw Him as who He is, a member of the __________. He is very man of very _____, but He is very God of very _____. He is preeminent in creation because He is the __________. He is preeminent in redemption because He is the ___________. He is preeminent in the churches because He is the One who gave Himself for the _________. Now we come to the place where God, through Paul, insists that He must be made _____________ in our lives. So far, in Colossians, Paul has discussed the different things that lead people away from ________. The Christian life is to live out the life of ________. ________ ________ is all we need. This practical section shows the believer ________, the fullness of _____, poured out in life through ____________—that is the only way He can be poured out. The “if” of Colossians 3.1, was, like the “if” of Colossians 1.23, the “if” of argument, not the if of condition. The Colossian believers had risen with ________. Their lives evidenced their ____________. They showed their ______ they had for all the saints (See Colossians 1.4). A practical example is a church member’s ______ for the other church members. He shows that ______ by supporting the Bible ministries of the pastor and other church members, by supporting the church which is the whole body of believers and every member of the church. A pastor, for example, shows his ______ for the church member by edifying each church member and by supporting and encouraging each member in their ministries. All bestowing the most honor on the least honorable. 1 Corinthians 12:22-26: “22 Nay, much more those members of the ______, which seem to be more feeble, are ____________: 23 And those members of the ______, which we think to be less honourable, upon these we bestow more abundant honour; and our uncomely parts have more abundant comeliness. 24 For our comely parts have no need: but God hath tempered the body together, having given more abundant honour to that part which lacked: 25 That there should be no schism in the body; but that the members should have the same care one for another. 26 And whether one member suffer, all the members suffer with it; or one member be honoured, all the members rejoice with it. Thus, every church member is to recognize not only his own part, but also the part of every other member of the local church ______, putting all others in the local church ______ before __________ and before every one who is not in the local church _______. The member who is not a pastor is to primarily support and promote his pastor, not some other pastor; he is to first support the other members of his church ______ and their gifts, not those of outsiders, whether believer or not. One is not to grieve his pastor by giving his primary adulation, attention, and support to some other pastor or teacher. Likewise, a pastor who honors New Testament church doctrine will give his first support, attention, consideration, and promotion to the members of his church _______, not to pastors, teachers, believers, and others who are not a part of the local church ______ which ________ made him a part of—there is no universal ________ at this time. Yes, he is to love everyone, and every believer. He can glean from others. However, his first and primary love, consideration, and support is to be given the other members of his church ______, ________ being the head. God gave very special rules for the local church ______. “That there should be no ________ in the body; but that the members should have the same ______ one for another.” Ephesians emphasizes that the local church is a spiritual ______. That ______ can become the victim of self-inflicted disease caused by lack of love by members of the church body. 1 Corinthians 13 teaches on God’s love (_________); the context is the church body and the gifts of the body—1 Corinthians 12. Of course, that love is to extend to everyone, but the body is the focus and primary. Others outside the local body are not part of the same spiritual ______, not part of the same organism. It would be wise to notice that every church body is not a ____________ organism only; many are either worldly organizations or hybrids, part __________ and part ____________. Everyone who is a member of a church is a member of one of these types of ___________. It is wise to consider that aspect of every believer, pastor, and teacher. Any pastor, teacher, or other believer who knows the Bible doctrines of church, state, and separation of church and state and leaves the church he is a member of in a compromised state does not love His Lord with all his ________, ______, mind and ___________. Such a believer is partly (or maybe wholly) ____________ at the very least and is not to be applauded by other believers. By compromised state is meant, the state of being a _________ entity such as a corporation, 501c3 or 508 tax exempt religious organization. In verse 1, the believer is told to “_______ those things which are above.” Where is Christ today? Where is the believer to set his affections? “If ye then be risen with Christ, seek those things which are _______, where ________ sitteth on the right hand of _____” (Colossians 3:1). “Set your affection on things ________, not on things on the ________” (Colossians 3:2). ______ and set your ____________ on the things of Christ. The things of Christ are ______, _________, ______, ______, _________, and of ______ _________ (See Philippians 4.8). “For ye are ______, and your life is hid with ________ in _____” (Colossians 3:3). When does a believer die? Give a Bible explanation for your answer. Whose life is the life of the believer? Give a Bible explanation of your answer. God gave his people in the Old Testament ordinances that are only ritual (a religious or solemn ceremony consisting of a series of actions performed according to a prescribed order.) and liturgical (relating to a form or formulary according to which public religious worship is conducted). Paul explains that those were merely “a shadow of things to come” (verse 17). They were pictures of Christ. Since Christ has come, there is no need to go back to the picture. “To whom God would make known what is the riches of the glory of this mystery among the Gentiles; which is Christ in you, the hope of glory” (Colossians 1:27). Colossians 2.18, 19 is a warning against mysticism (belief that union with or absorption into the Deity or the absolute, or the spiritual apprehension of knowledge inaccessible to the intellect, may be attained through contemplation and self-surrender). Paul here is condemning the Gnostics who made a pretense of wisdom. Today, some in churches assume a pious superiority. They are “spiritual snobs.” These people, generally, are very ignorant of the Bible. “Intruding into those things which he hath not seen.” That is a pretense, putting on, acting like you have something that you don’t really have. Those spoken of in the question 3, are not “holding the Head, from which all the body by joints and bands having nourishment ministered, and knit together, increaseth with the increase of God” (Colossians 2:19). What a description! Chapters 3 and 4 are the practical section of Colossians. In chapters 1 and 2 we saw the preeminence of Christ. We saw Him as who He is, a member of the Trinity. He is very man of very man, but He is very God of very God. He is preeminent in creation because He is the Creator. He is preeminent in redemption because He is the Redeemer. He is preeminent in the churches because He is the One who gave Himself for the church. Now we come to the place where God, through Paul, insists that He must be made preminent in our lives. So far, in Colossians, Paul has discussed the different things that lead people away from Christ. The Christian life is to live out the life of Christ. Christ Jesus is all we need. This practical section shows the believer Christ, the fullness of God, poured out in life through believers—that is the only way He can be poured out. The “if” of Colossians 3.1, was, like the “if” of Colossians 1.23, the “if” of argument, not the if of condition. The Colossian believers had risen with Christ. Their lives evidenced their salvation. They showed their love they had for all the saints (See Colossians 1.4). A practical example is a church member’s love for his pastor and the other church members. He shows that love by supporting the Bible ministries of the pastor and other church members, by supporting the church which is the whole body of believers and every member of the church. A pastor, for example, shows his love for the church member by edifying each church member and by supporting and encouraging each member in their ministries. All bestowing the most honor on the least honorable. 1 Corinthians 12:22-26: “22 Nay, much more those members of the body, which seem to be more feeble, are necessary: 23 And those members of the body, which we think to be less honourable, upon these we bestow more abundant honour; and our uncomely parts have more abundant comeliness. 24 For our comely parts have no need: but God hath tempered the body together, having given more abundant honour to that part which lacked: 25 That there should be no schism in the body; but that the members should have the same care one for another. 26 And whether one member suffer, all the members suffer with it; or one member be honoured, all the members rejoice with it. Thus, every church member is to recognize not only his own part, but also the part of every other member of the local church body, putting all others in the local church body before himself and before every one who is not in the local church body. The member who is not a pastor is to primarily support and promote his pastor, not some other pastor; he is to first support the other members of his church body and their gifts, not those of outsiders, whether believer or not. One is not to grieve his pastor by giving his primary adulation, attention, and support to some other pastor or teacher. Likewise, a pastor who honors New Testament church doctrine will give his first support, attention, consideration, and promotion to the members of his church body, not to pastors, teachers, believers, and others who are not a part of the local church body which Christ made him a part of—there is no universal church at this time. Yes, he is to love everyone, and every believer. He can glean from others. However, his first and primary love, consideration, and support is to be given the other members of his church body, Christ being the head. God gave very special rules for the local church body. “That there should be no schism in the body; but that the members should have the same care one for another.” Ephesians emphasizes that the local church is a spiritual body. That body can become the victim of self-inflicted disease caused by lack of love by members of the church body. 1 Corinthians 13 teaches on God’s love (charity); the context is the church body and the gifts of the body—I Corinthians 12. Of course, that love is to extend to everyone, but the body is the focus and primary. Others outside the local body are not part of the same spiritual body, not part of the same organism. It would be wise to notice that every church body is not a spiritual organism only; many are either worldly organizations or hybrids, part worldly and part spiritual. Everyone who is a member of a church is a member of one of these types of churches. It is wise to consider that aspect of every believer, pastor, and teacher. Any pastor, teacher, or other believer who knows the Bible doctrines of church, state, and separation of church and state and leaves the church he is a member of in a compromised state does not love His Lord with all his heart, soul, mind and strength. Such a believer is partly (or maybe wholly) worldly at the very least and is not to be applauded by other believers. By compromised state is meant, the state of being a legal entity such as a corporation, 501c3 or 508 tax exempt religious organization. In verse 1, the believer is told to “seek those things which are above.” Where is Christ today? Seek and set your affection on the things of Christ. The things of Christ are true, honest, just, pure, lovely, and of good report (See Philippians 4.8). c. when he is crucified. E.g., Galatians 2.20.
c. Christ’s life. E.g., Colossians 3.4. Christianity has, on one extreme, always been in danger of either evaporating into a philosophy, in which case it becomes nothing but steam. An example of this is the philosophy of John Calvin which, among other things, redefines the Sovereignty of God and denies the free will of man. On the other hand, the opposite danger is that it will freeze into a form and become nothing more than a ritual. Christ is neither steam nor ice, neither of which can sustain life. Rather, He is water. That is why we need to guard against following a ______________ (e.g., Roman Catholicism or the Calvinism of John Calvin) or a ________ (e.g., Roman Catholicism and Protestantism). Christianity is ________. Christ is the answer to man’s head and his _______. Paul deals with five errors that endangered the Colossian church in Chapter 2: Enticing ________ (verses 4-7); b. ______________ (verses 8-13); c. ___________ (verses 14-17); d. ____________ (verses 18, 19) e. _____________ (verses 20-23). These are dangers today. Many _______ believers have slipped into one or more of these errors. Paul had great conflict (agony) in his heart for the churches at ________ and _________. He had not been to _________ and ________—they and others had not seen Paul. Paul saw that there was great ________ and it caused great conflict in Paul’s _______. “That their hearts might be comforted, being knit together in love.” Heart indicates the entire inner _____, the whole propulsive nature of _____, their whole person. “Unto all riches of the full assurance of understanding.” Nothing but ________ can lead the believer to truth. “Sanctify them through thy _______: thy word is _______” (John 17:17). The mystery spoken of in verse 2 is the institution of the ________. It is a mystery because it had not been revealed in the _____ ___________. Baptism brings unity since all members of a local New Testament church are ________ into one ______. A body must be local and connected to all other parts. Otherwise, it is not a body. We are told to “endeavor to keep the unity of the spirit in the bond of _______” (Ephesians 4.3). How? By doing all the things God’s Word instructs us to do, not by falling prey to enticing _______, _____________, __________, ___________ , or ___________; by remaining in ________. ________ is the reservoir of all ____________. Paul warns them, in verse 4, not to let any man “beguile you with __________ _______.” __________ _______ are a lot of oratory or sweet talk. “_________” means to victimize. Believers are to follow the Word of God and not a ____________ or an _____________. The purpose of a church or believer is not to make one feel ______ all over. One purpose of a pastor is to preach the Word of God and make application for the _____________ of the body (See, e.g. 1 Corinthians 10.8, 13.10, 14.4-5, 12, 26; 2 Timothy 4.1-5; 1 Thessalonians 5.11; 1 Peter 5, 2). Believers are to follow the pastor as the pastor follows the ______ of God, in charity shepherding and overseeing the body so that all members may exercise their God-given gifts and function as a healthy ______ accomplishing their God-given goal (See, e.g. Romans 12.4-8, 1 Corinthians 12-13, Ephesians 4). At the time this epistle was written the church at Colosse were in proper _______ and they were “_________” in their faith (verse 5).. Church members ought to be ___________ shoulder to shoulder, not undermining or taking advantage of other church members. Paul instructs believers to ______ in Christ, “________ and _______ up in him, and stablished in the _______ as ye have been ________, abounding therein with _______________.” Walk in _________, walk in the _________. Philosophers such as Kant, Locke, and Bultmann do not have a high view of the inspiration of the ______ of _____. Some very prominent theologies are based upon philosophy and not on a literal reading of the ______ of God. They look for the answers to the problems of life which are not found in _____________, in ________ knowledge. _________ is the answer to philosophy. “But of him are ye in Christ Jesus, who of God is made unto us ________, and righteousness, and sanctification, and redemption” (1 Corinthians 1:30). Christ told the religious leaders of his day: “Why do ye also transgress the commandment of God by your ____________?” (Matthew 15:3). Verse 9 is a clear statement of the ________ of Christ. Verse 10 makes clear that only in Christ alone are you ___________. What is your question? ________ is the answer. What is your need? Turn to ________. Are you carried away by enticing words? Turn to ________. Are you carried away by the systems and traditions of men? Turn to ________. Verse 11 teaches that the real circumcision is the new _______. “For in Christ Jesus neither _______________ availeth any thing, nor __________________, but a _____ creature” (Galatians 6:15). Therefore if any man be in Christ, he is a _____ creature: old things are passed away; behold, all things are become _____” (2 Corinthians 5:17). a. the resurrection power of God. d. taking some course that will enable you to live for God. a. improvement of the old nature. b. impartation of a new nature. One philosophy is, then as now, that men can live so nobly that death cannot matter—one is not to be uplifted by good fortune nor cast down by adversity” (Stoicism). Another philosophy, Epicureanism, teaches that all is uncertain so it is vain to deny ourselves any present joy in view of possible future ill; let us eat and drink until we die (Epicureanism). Both those systems address the _____ man who is in the flesh, not the _____ man. Those systems have gimmicks and systems set before them to enable them to live a “spiritual” or a “good” life. No manmade _____________ works. The answer is to come into a personal relationship with _______ ________. What did Christ write on the cross? “And having ___________ principalities and powers, he made a shew of them openly, _____________ over them in it” (Colossians 2:15). Hallelujah! Christianity has, on one extreme, always been in danger of either evaporating into a philosophy, in which case it becomes nothing but steam. An example of this is the philosophy of John Calvin which redefines the Sovereignty of God and the free will of man. On the other hand, the opposite danger is that it will freeze into a form and become nothing more than a ritual. Christ is neither steam nor ice, neither of which can sustain life. Rather, He is water. That is why we need to guard against following a philosophy (Roman Catholicism or John Calvin) or a ritual (e.g., Roman Catholicism). Christianity is Christ. Christ is the answer to man’s head and his heart. Paul deals with five errors that endangered the Colossian church in Chapter 2: Enticing words (verses 4-7); b. Philosophy (verses 8-13); c. Legality (verses 14-17); d. Mysticism (verses 18, 19) e. Asceticism (verses 20-23). These are dangers today. Many Bible believers have slipped into one or more of these errors. Paul had great conflict (agony) in his heart for the churches at Colosse and Laodicea. He had not been to Laodicea and Colosse—they and others had not seen Paul. Paul saw that there was great danger and it caused great conflict in Paul’s heart. “That their hearts might be comforted, being knit together in love.” Heart indicates the entire inner man, the whole propulsive nature of man, their whole person. “Unto all riches of the full assurance of understanding.” Nothing but Christ can lead the believer to truth. “Sanctify them through thy truth: thy word is truth” (John 17:17). The mystery spoken of in verse 2 is the institution of the church. It is a mystery because it had not been revealed in the Old Testament. Baptism brings unity since all members of a local New Testament church are baptized into one body. A body must be local and connected to all other parts. Otherwise, it is not a body. We are told to “endeavor to keep the unity of the spirit in the bond of peace” (Ephesians 4.3). How? By doing all the things God’s Word instructs us to do, not by falling prey to enticing words, philosophy, legality, mysticism , or asceticism; by remaining in Christ. Christ is the reservoir of all knowledge. Paul warns them, in verse 4, not to let any man “beguile you with enticing words.” Enticing words are a lot of oratory or sweet talk. “Beguile” means to victimize. Believers are to follow the Word of God and not a philosophy or an individual. The purpose of a church or believer is not to make one feel good all over. One purpose of a pastor is to preach the Word of God and make application for the edification of the body (See, e.g. 1 Corinthians 10.8, 13.10, 14.4-5, 12, 26; 2 Timothy 4.1-5; 1 Thessalonians 5.11; 1 Peter 5, 2). Believers are to follow the pastor as the pastor follows the Word of God, in charity shepherding and overseeing the body so that all members may exercise their God-given gifts and function as a healthy body accomplishing their God-given goal (See, e.g. Romans 12.4-8, 1 Corinthians 12-13, Ephesians 4). At the time this epistle was written the church at Colosse were in proper order and they were “steadfast” in their faith (verse 5).. Church members ought to be standing shoulder to shoulder, not undermining or taking advantage of other church members. Paul instructs believers to walk in Christ, “rooted and built up in him, and stablished in the faith as ye have been taught, abounding therein with thanksgiving.” Walk in Christ, walk in the Spirit. Philosophers such as Kant, Locke, and Bultmann do not have a high view of the inspiration of the Word of God. Some very prominent theologies are based upon philosophy and not on a literal reading of the Word of God. They look for the answers to the problems of life which are not found in philosophy, in human knowledge. Christ is the answer to philosophy. “But of him are ye in Christ Jesus, who of God is made unto us wisdom, and righteousness, and sanctification, and redemption” (1 Corinthians 1:30). Christ told the religious leaders of his day: “Why do ye also transgress the commandment of God by your tradition?” (Matthew 15:3). Verse 9 is a clear statement of the deity of Christ. Verse 10 makes clear that only in Christ alone are you complete. What is your question? Christ is the answer. What is your need? Turn to Christ. Are you carried away by enticing words? Turn to Christ. Are you carried away by the systems and traditions of men? Turn to Christ. Verse 11 teaches that the real circumcision is the new birth. “For in Christ Jesus neither circumcision availeth any thing, nor uncircumcision, but a new creature” (Galatians 6:15). Therefore if any man be in Christ, he is a new creature: old things are passed away; behold, all things are become new” (2 Corinthians 5:17). One philosophy is, then as now, that men can live so nobly that death cannot matter—one is not to be uplifted by good fortune nor cast down by adversity” (Stoicism). Another philosophy, Epicureanism, teaches that all is uncertain so it is vain to deny ourselves any present joy in view of possible future ill; let us eat and drink until we die (Epicureanism). Both those systems address the old man who is in the flesh, not the new man. Those systems have gimmicks and systems set before them to enable them to live a “spiritual” or a “good” life. No manmade philosophy works. The answer is to come into a personal relationship with Jesus Christ. “And having spoiled principalities and powers, he made a shew of them openly, triumphing over them in it” (Colossians 2:15). Hallelujah! 1.24 says “Who now rejoice in my sufferings for you, and fill up that which is behind of the afflictions of Christ in my flesh for his body’s sake, which is the church.” Paul was ____________ in his body for the sake of Christ’s body. When Paul (and other believers) ________ for the body (the local church), it completes the ____________ of Christ. Thus, there is still something to be ______. Paul is writing from prison and here he says he has fulfilled all his _____________ in fulfillment of Ac. 9.15-16: “15 But the Lord said unto him, Go thy way: for he is a chosen vessel unto me, to bear my name before the Gentiles, and kings, and the children of Israel: 16 For I will shew him how great things he must ________ for my name’s sake.” These _____________ of Paul were not redemptive. a. The first suffering which Christ could not share was His human suffering. Paul wrote, “For every man shall bear his own burden” (Ga. 6.5). Thus, there are certain burdens we must each bear _______. We are born _______, feel pain _______. We must face certain problems _______. There is a sorrow that comes which no one can share with us. No one can take our place when we become sick. You cannot take your child’s place when he or she becomes sick. No one can go through the valley of the shadow of death for another. b. The second ____________ which Christ could not share was His ____________ as the Son of God. We see this suffering in Psalm 69. In verses 11 and 12, we learn that He was the song of ___________ and that He made ___________ His garment. Because He was the son of God, He was __________ by the Roman soldiers. The soldiers of the high priest _________ Him. They played a game in which they _____________ him, and all the soldiers _____ him with their fists. Even when he named the right one, they would not admit it but would ___________ him again and play the same game. He was marred more than any man. His face was beaten to a ______. He ___________ in a way no man has ever ___________ because he ___________ as the Son of God. a. There is the suffering for _____________’ sake. Jesus suffered for _____________’ sake. “But now ye seek to kill me, a man that hath told you the _______, which I have heard of God” (John 8:40). Believers are to continue in the example of Paul and the other Apostles. When they do so, they will experience ministerial suffering. They will suffer _____________. “Yea, and all that will live godly in Christ Jesus shall suffer _____________” (2 Timothy 3:12). If you are going to live for God, if you are going to take a stand for the right, you will find that you will be passed by. God’s men are passed by today in the distribution of ___________ honors. “The world and many ‘Christians’ will damn the man of God with faint ________, and they will praise him with faint _______.” That is the way many believers as well as lost people treat _______ men. Athletes are lauded; people in the entertainment world are praised; politicians are praised; professors are honored; Christian __________ who have forsaken Bible truth concerning church _______________ teach their ______ at seminaries, Bible __________, and ___________ and sell their heretical books to Christians who _________ follow their teachings; and heretical __________ and _________ within the “Christian” sphere are lauded, praised, and looked up to by millions and their books, sermons, ____________ and __________ teachings, etc. are believed and followed. But the believer who teaches the truth about certain matters is ___________. If you stand for the things that are right in this world, you will suffer for righteousness’ sake. Paul understood this. That will be the lot for anyone who stands for _____ using _______ methods. b. Then there is the suffering in the measure we identify ourselves with Christ for the proclamation of the _________ The Lord Jesus made this clear, “If the _______ ______ you, ye know that it hated me before it hated you. If ye were of the ________, the _______ would love his own: but because ye are not of the _______, but I have chosen you out of the ________, therefore the world _________ you” (John 15:18-19). “The popularity of the world and the ‘Christian’ community is in inverse ration with his popularity with Christ.” If you are popular with the world and with the general “Christian” community in America, you will not be popular with Christ. The child of God is to take his rightful place and identify himself with Christ. When we suffer for Christ, the Lord Jesus is also suffering through us, through His local church you are a member of. Remember what the Lord Jesus said to Saul on the road to __________, “Saul, Saul, why ______________ thou me” (Acts 9.4). Saul thought he was ______________ Christians. He was shocked to learn that he was actually ______________ the Lord Jesus Christ. The Lord Jesus suffers when His children are ____________. If the Gospel and the truths of the Word of God are to go forward today, someone must _________. Believers who take the Word of God seriously and act upon the truths therein will _________. Local churches who take the Word of God seriously will understand that they “are no more ____________ and _____________, but _________________ with the saints, and of the ___________ of God; And are built upon the ______________ of the apostles and prophets, ________ ________ himself being the chief ________ _______; In whom all the ___________ fitly framed together groweth unto an holy temple in the Lord: In whom ye also are builded together for an _____________ of God through the Spirit” (Ep. 2:19-22). How many of God’s dispensations have been based on the redemption that is in Christ Jesus? In Colossians 1.25, Paul makes clear that this is a new dispensation of _____, given ______, “for ______” (____________). A mystery is something that had not been revealed in the _____ ___________ but is now revealed. The mystery spoken of in Colossians 1.26 that is that God would now put _________ on the same basis as the __________. God is now saving both ______ and __________, people of all _______, and making them part of the ________ of God. God also ordains local autonomous New Testament __________ made up of born again _____________. This mystery was now made manifest not only to Paul, but also to his ________. Christ in the believer is the “______ of ________” (Colossians 1.27). a. to preach the gospel in order to win sinners to Christ and to save them from the wrath that is to come. b. to build up believers so that they may grow in grace and be faithful members of and serve Christ in the local assembly. 1.24 says “Who now rejoice in my sufferings for you, and fill up that which is behind of the afflictions of Christ in my flesh for his body’s sake, which is the church.” Paul was suffering in his body for the sake of Christ’s body. When Paul (and other believers) suffer for the body (the local church), it completes the suffering of Christ. Thus, there is still something to be done. Paul is writing from prison and here he says he has fulfilled all his sufferings in fulfillment of Ac. 9.15-16: “15 But the Lord said unto him, Go thy way: for he is a chosen vessel unto me, to bear my name before the Gentiles, and kings, and the children of Israel: 16 For I will shew him how great things he must suffer for my name’s sake.” These sufferings of Paul were not redemptive. a. The first suffering which Christ could not share was His human suffering. Paul wrote, “For every man shall bear his own burden” (Ga. 6.5). Thus, there are certain burdens we must each bear alone. We are born alone, feel pain alone. We must face certain problems alone. There is a sorrow that comes which no one can share with us. No one can take our place when we become sick. You cannot take your child’s place when he or she becomes sick. No one can go through the valley of the shadow of death for another. b. The second suffering which Christ could not share was His suffering as the Son of God. We see this suffering in Psalm 69. In verses 11 and 12, we learn that He was the song of drunkards and that He made sackcloth His garment. Because He was the son of God, He was arrested by the Roman soldiers. The soldiers of the high priest mocked Him. They played a game in which they blindfolded him, and all the soldiers hit him with their fists. Even when he named the right one, they would not admit it but would blindfold him again and play the same game. He was marred more than any man. His face was beaten to a pulp. He suffered in a way no man has ever suffered because he suffered as the Son of God. a. There is the suffering for righteousness’ sake. Jesus suffered for righteousness’ sake. “But now ye seek to kill me, a man that hath told you the truth, which I have heard of God” (John 8:40). Believers are to continue in the example of Paul and the other Apostles. When they do so, they will experience ministerial suffering. They will suffer persecution. 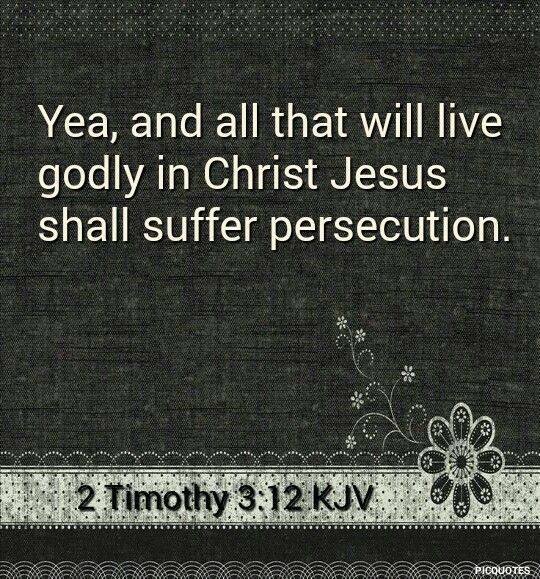 “Yea, and all that will live godly in Christ Jesus shall suffer persecution” (2 Timothy 3:12). If you are going to live for God, if you are going to take a stand for the right, you will find that you will be passed by. God’s men are passed by today in the distribution of earthly honors. “The world and many ‘Christians’ will damn the man of God with faint praise, and they will praise him with faint damns.” That is the way many believers as well as lost people treat God’s men. Athletes are lauded; people in the entertainment world are praised; politicians are praised; professors are honored; Christian lawyers who have forsaken Bible truth concerning church organization teach their lies at seminaries, Bible Colleges, and churches and sell their heretical books to Christians who blindly follow their teachings; and heretical teachers and pastors within the “Christian” sphere are lauded, praised, and looked up to by millions and their books, sermons, heretical and apostate teachings, etc. are believed and followed. But the believer who teaches the truth about certain matters is vilified. If you stand for the things that are right in this world, you will suffer for righteousness’ sake. Paul understood this. That will be the lot for anyone who stands for God using God’s methods. b. Then there is the suffering in the measure we identify ourselves with Christ for the proclamation of the Gospel. The Lord Jesus made this clear, “If the world hate you, ye know that it hated me before it hated you. If ye were of the world, the world would love his own: but because ye are not of the world, but I have chosen you out of the world, therefore the world hateth you” (John 15:18-19). “The popularity of the world and the ‘Christian’ community is in inverse ration with his popularity with Christ.” If you are popular with the world and with the general “Christian” community in America, you will not be popular with Christ. The child of God is to take his rightful place and identify himself with Christ. When we suffer for Christ, the Lord Jesus is also suffering through us, through His local church you are a member of. Remember what the Lord Jesus said to Saul on the road to Damascus, “Saul, Saul, why persecuteth thou me” (Acts 9.4). Saul thought he was persecuting Christians. He was shocked to learn that he was actually persecuting the Lord Jesus Christ. The Lord Jesus suffers when His children are persecuted. If the Gospel and the truths of the Word of God are to go forward today, someone must suffer. Believers who take the Word of God seriously and act upon the truths therein will suffer. Local churches who take the Word of God seriously will understand that they “are no more strangers and foreigners, but fellowcitizens with the saints, and of the household of God; And are built upon the foundation of the apostles and prophets, Jesus Christ himself being the chief corner stone; In whom all the building fitly framed together groweth unto an holy temple in the Lord: In whom ye also are builded together for an habitation of God through the Spirit” (Ep. 2:19-22). All of God’s dispensations have been based on the redemption that is in Christ Jesus. In Colossians 1.25, Paul makes clear that this is a new dispensation of God, given Paul, “for you” (believers). A mystery is something that had not been revealed in the Old Testament but is now revealed. The mystery spoken of in Colossians 1.26 is that God would now put Israel on the same basis as the Gentiles. God is now saving both Jews and Gentiles, people of all races, and making them part of the family of God. God also ordains local autonomous New Testament churches made up of born again believers. This mystery was now made manifest not only to Paul, but also to his saints. Christ in the believer is the “hope of glory” (Colossians 1.27). d. all of the above (get out the gospel that men might be saved, baptize them into a local New Testament church, build them up in the faith). This article is written during a long period of grief and sorrow, suffering and persecution. First, it briefly deals with the issue of false teachings concerning church organization and links to an online teaching on this matter. The article linked to also explains correct Bible church organization. Dealing with this issue is the source of much suffering. Next, the article explains the suffering and persecution which any believer who takes a Bible based stand for God, including God’s churches and church principles, must endure. Sadly, the sources of such suffering come from everywhere—from within and without. When from within, “judgment must begin at the House of God; and if it first begin at us, what shall the end be of them that obey not the gospel of God?” Finally, the article quotes some very relevant Bible verses for guidance of believers in a church in the midst of suffering and persecution. As mentioned above, dealing with matters like this brings grief and sorrow, suffering and persecution to a believer. It is not fun to expose lies and anti-Biblical teaching and practices, especially when they are disseminated by so-called men of God. When one stands for Christ and/or His churches, he will suffer. Jesus is our example. “He is despised and rejected of men; a man of sorrows, and acquainted with grief: and we hid as it were our faces from him; he was despised, and we esteemed him not” (Is. 53.3). Christ “loved the church and gave himself for it.” Likewise did the apostles. Colossians 1:24 “Who now rejoice in my sufferings for you, and fill up that which is behind of the afflictions of Christ in my flesh for his body’s sake, which is the church:” Paul, in following Christ, suffered for “the body’s sake, which is the church.” Of course, on earth, the institution of the church is manifested in the local New Testament church. “Colossians” was written to and for the church at Colosee, with principles that God desires to be applied to every New Testament church body. Just read the epistles of Paul to get an idea of his suffering and contention for and within the local church. Of course, the church at Philippi was an exception. It was a church which had only insignificant problem(s)—no false doctrine as the churches of Galatia; no problems with Christian conduct as with the church at Corinth. My pastor just preached a sermon concerning Christian suffering. He pointed out that this is something that all believers who seek to follow Christ will do. They will suffer for Christ’s sake. Before hearing that sermon, I never considered that much of my suffering and anguish since salvation have come because of my feeble attempts to follow our Lord. I had equated the “suffering and persecution” of Christians with that of the martyrs. But as the pastor preached, the continuing sufferings encountered by believers within a church who is at least attempting to honor the Lord Jesus Christ may be worse than that of the martyrs in the sense that the grief and sorrow brought from internal church associations and matters continue. They do not suddenly and quickly disappear. These sufferings are varied: For example, marriage problems for a newly saved believer caused by his regeneration; rejection of Christ by the believer’s friends and relatives; adverse reactions by co-workers, bosses, people of influence who can help or hinder his advancement in his chosen occupation of profession (e.g., a believer following his Lord no longer drinks, parties, etc. with them as before); suffering caused by conflict between believers within and without a church over true versus false doctrine or conduct (maybe the most distressing type of suffering); etc. As a believer grows in knowledge, understanding, and application of Bible truth, conflicts, suffering, and persecution increase. Christ will call such a believer to do a work for Him according to the gift(s) which He extends to the believer. May times, the exercise of the believer’s gift(s) will bring that believer into conflict with other believers, many times others within the church he is a member of. Those conflicts are many times kept hidden within but they grow like a cancer; they cannot be hidden. Unresolved tension in and of itself brings suffering and persecution. The conflict, suffering, and persecution between believers is the worst, the hardest to deal with, the most hurtful, the cause of the most severe sorrow and grief. What is one to do? Betray Christ or suffer? Confront those with whom the conflict exists of let it smoulder? There are two kinds of sufferings: ministerial suffering and mediatorial suffering. Christ’s sufferings were mediatorial. Meditorial sufferings are of two kinds. Those which Christ endured and in which we cannot share. This is His human suffering which he endured as a man. These sufferings would include hunger and thirst, loneliness, anguish, pain, sorrow, and weariness. Paul wrote, “For every man shall bear his own burden” (Ga. 6.5). Thus, there are certain burdens we must each bear alone. We are born alone, feel pain alone. We must face certain problems alone. There is a sorrow that comes which no one can share with us. No one can take our place when we become sick. You cannot take your child’s place when he or she becomes sick. No one can go through the valley of the shadow of death for another. The second suffering which Christ could not share was His suffering as the Son of God. We see this suffering in Psalm 69. In verses 11 and 12, we learn that He was the song of drunkards and that He made sackcloth His garment. Because He was the son of God, He was arrested by the Roman soldiers. The soldiers of the high priest mocked Him. They played a game in which they blindfolded him, and all the soldiers hit him with their fists. Even when he named the right one, they would not admit it but would blindfold him again and play the same game. He was marred more than any man. His face was beaten to a pulp. He suffered in a way no man has ever suffered because he suffered as the Son of God. On the other hand, there are sufferings Christ endured which we can share. These are the sufferings which Paul refers to in Colossians 1.24. There is suffering for righteousness’s sake. Jesus suffered for righteousness’ sake. “But now ye seek to kill me, a man that hath told you the truth, which I have heard of God: this did not Abraham” John 8:40). Believers are to continue in the example of Paul and the other Apostles. When they do so, they will experience ministerial suffering. They will suffer persecution. “Yea, and all that will live godly in Christ Jesus shall suffer persecution” (2 Ti. 3:12). If you are going to live for God, if you are going to take a stand for the right, you will find that you will be passed by. God’s men are passed by today in the distribution of earthly honors. “The world and many ‘Christians’ will damn the man of God with faint praise, and they will praise him with faint damns.” That is the way many believers as well as lost people treat God’s men. Athletes are lauded; people in the entertainment world are praised; politicians are praised; professors are honored; Christian lawyers who have forsaken Bible truth concerning church organization teach their lies at seminaries, Bible Colleges, and churches and sell their heretical books to Christians who blindly follow their teachings; and heretical teachers and pastors within the “Christian” sphere are lauded, praised, and looked up to by millions and their books, sermons, heretical and apostate teachings, etc. are believed and followed. If you stand for the things that are right in this world, you will suffer for righteousness’ sake. Paul understood this. That will be the lot for anyone who stands for God using God’s methods. Then there is the suffering in the measure we identify ourselves with Christ for the proclamation of the Gospel. The Lord Jesus made this clear, “If the world hate you, ye know that it hated me before it hated you. If ye were of the world, the world would love his own: but because ye are not of the world, but I have chosen you out of the world, therefore the world hateth you” (John 15:18-19). “The popularity of the world and the ‘Christian’ community is in inverse ration with his popularity with Christ.” If you are popular with the world and with the general “Christian” community in America, you will not be popular with Christ. The child of God is to take his rightful place and identify himself with Christ. When we suffer for Christ, the Lord Jesus is also suffering through us and through His local church we are members of. See the following webpage for a lot of Scripture which deals with suffering and persecution of the believer: Persecution and Suffering. Note. Many of the insights in the above article were gleaned from Colossians by Dr. J. Vernon McGee.